It is unlike the typical cloth-making factory which is equipped with huge machines to take the stress off the apprentice. In a typical aso-oke factory, the blood is the fuel that propels the crocheting that produces the synthetic fibres to form fascinating patterns. The setting has a semblance of a football pitch, with posts erected on both sides. There are sheds facing each other, made from planks and corrugated iron sheets, complemented with strewn sack materials to shield workers from the scorching heat of the sun. Under each shed are four apprentice weavers facing each other in their segmented horizontal looms. Their task is as daunting as it is competitive. Before them is a “burden” which is wound around a wooden carrier, to which threads are attached and stretched at a distance of about 12 metres to each weaver. The onerous task is to engage in the weaving process as fast as possible which will eventually see the “burden” pulled to the feet of the weaver, with the eventual outcome of having woven as many as 15 pieces of patterned aso-oke fabrics. Each piece, which has a width of about 15 centimetres, and length of about 50 cm, is then stitched together to make traditional outfits like agbada ( a flowing wide-sleeved robe for men), fila (men’s traditional cap), iro (women’s wrapper), gele (women’s head gear), and Ipele or Iborun – shoulder sash or shawl. No special prices will be awarded to whoever finishes first but then, it is also a test of the weaver’s prowess, indeed, manliness. For a piece of aso-oke fabric woven, each apprentice is paid N100. It is a daunting task that Egbetsiafa Philip, now in his 40s, has been engaged in since 1992 when he started out to learn the art of making the fabrics in the Volta Region of Ghana. “The pattern depends on what the customer wants, and there is no pattern under the sun that we cannot create, as long as it can be written down. We can weave the thread to create the pattern in aso-oke,” says Philip in his Ghanaian accent. Philip, who learnt the art of making aso-oke fabrics in Ghana from 1992 to 1996, moved to Ojokoro area of Lagos, in 1997 and has continued the age-old traditional art. Patterned aso-oke fabrics, used for various clothing outfits like the trademark fila of a former governor of Lagos State, Asiwaju Bola Tinubu, have become not only a fashion trend in the society, but a status symbol. It is akin to a fashion label that stands an individual out from the crowd. At many parties, it is a common sight to see gorgeously dressed women with gele, wriggle their waists with rhythmical steps to tunes blaring from speakers. Such geles are usually stylishly tied in glamorous styles that literally announce the presence of the wearer in any of such parties. In a number of instances, they are complemented with Ipele or Iborun. Parties like wedding and engagement ceremonies in the South-West are incomplete without the use of aso-oke. “Many people love aso-oke, especially women, even naming ceremonies are not complete without wearing aso-oke,” Alexander Geogisberg, an aso-oke weaver says. Geogisberg, like Philip, left Ghana for Nigeria in 1997, because the allure and market for aso-oke is more in Nigeria. “I also have my shop in Ghana, but I decided to come to Nigeria because the market in Nigeria is more than the one in Ghana.” Geogisberg says. But as alluring as aso-oke is, the process of making the fabric comes with pain and stress. “There’s the joy of seeing the aso-oke when one finishes weaving but the thing is that it comes with great stress and body ache,” Agbetsiafa Bright says, as he swallows two tablets of analgesic and stretches his body. It was the second time he swallowed the tablets in about five hours. To weave 15 strips of aso-oke could take a whole day depending on the pattern to be designed on the fabrics and the strength of the weaver. Philip shares Bright’s views. 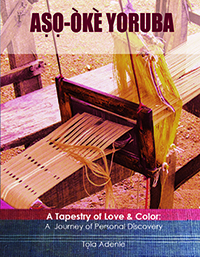 “It gives a lot of stress because one sits in one spot for hours as one continues to weave the threads. But for me, I see it as exercise,” he says. There can be short breaks at intervals of five hours in-between the weaving, depending on the resilience of the weaver. It is a period used only to refresh and to eat, before the weaver returns to the loom to continue the weaving process. The setting of the tools relies on the technique that involves interlacing a set of thread, warp and weft, at right angles, to form the striped patterns on the fabrics. 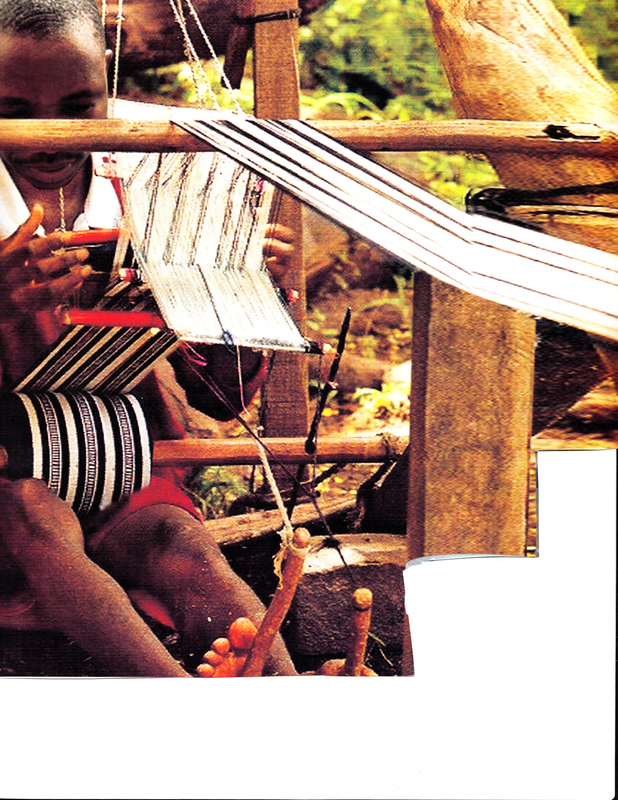 The set of threads, interlaced on the loom is arranged in line with the pattern or design to be created on the fabrics. For more elaborate design, the weaver adds supplementary wefts. It is an age-old technology that has apparently defied modern technology. “I can tell you that no machine whether in China or wherever can make the aso-oke fabrics that we make. The types of fabrics some people use machine to make only try to look like aso-oke, but it is not the same like the ones we weave here, “Philip states. The horizontal looms where weavers like Philip, Geogisberg and Bright sit for hours as they weave the thread, are shaped like log cabins. Each weaver inserts the thread into the aasa (striker) through the omu (extenders). On the upper hand of the omu is the okeke (wheel) used for pulling the omu. There are two itese (pedals) under the omu, which the weaver presses down interchangeably during the weaving process. The itese when pressed enables the warp to open and the reel put through to one side while the aasa knocks the reel to another side making the reel to be finely set interchangeably. The weaver simultaneously handles the oko, throws it inside the open warp to be received by his other hand. The continuous process results in the thread being woven to aso-oke fabric. At intervals of about 15 minutes, the weaver uses the drawer to pull the carrier on which the thread is attached towards his loom. At the end of the process, 15 strips of aso-oke fabric would have been woven – enough to be stitched together to make fila and iborun for a newly wedded couple. Philip also says to make a complete outfit for a client, the weaving process can take as long as three days, to produce the strips that will afterwards be stitched together. But as stressful as the process is, Philip expresses delight in the trade. “I can tell you that I have several clients abroad. Even though there are many other types of attire, aso-oke will always have those that want to wear it,” he says. Indeed, the fabric has been in existence since the 8th century. An African-American who is a lover of aso-oke, Mrs. Akilimali Funua Olade, states, “It is the most beautiful attire in the world. Each time I wear it, I am as beautiful as I can be. Hello,please how do I connect with these people at ajokoro because I want to make some asooke for asooebi. I received the write-up through one of my blog visitors and the information I have is not more than what is in the essay. I think you should locate where Ojokoro is in Lagos and then fish out Mr. Egbetsiafa Philip’s Cooperative. It shouldn’t be too difficult.